I haven’t died… Yet. Suffering from all the wonderful winter bugs, as well as adapting to a less flexible lifestyle ( not figuratively, I’m not allowed to bend or twist my back anymore). So all has been a challenge, but I have been paper macheing all over the lounge while binge watching in front of the heater. As I haven’t taken any pictures to show you. I thought I’d take this opportunity to show of my two gorgeous cats. They’re so lovely… When they’re sleeping. 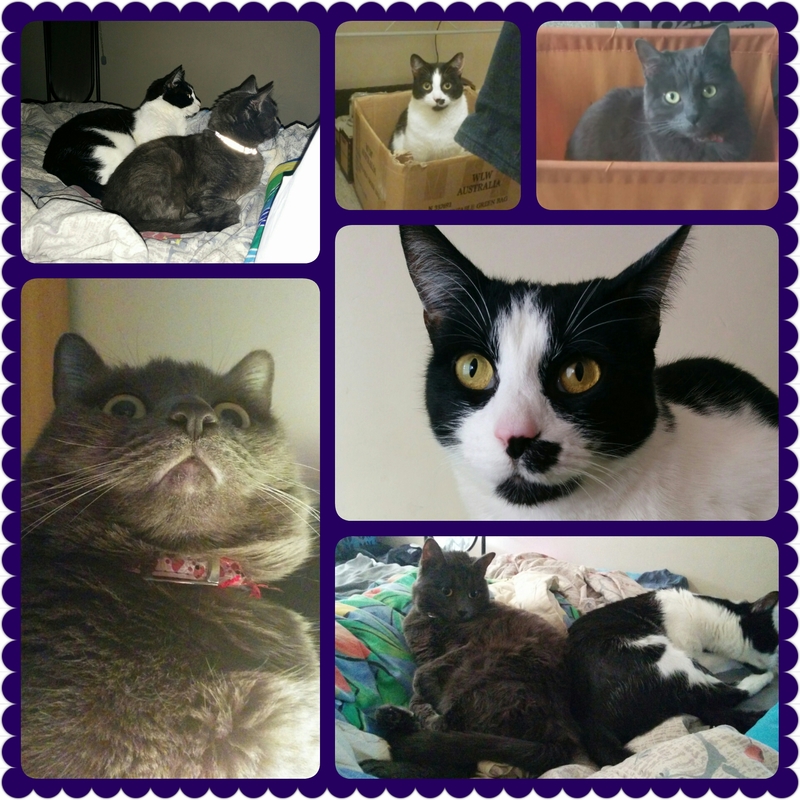 The black and white Tuxedo terror is named Charlie, and the grey sweetheart is Willow. The photos don’t do her coat justice. Ok, I have to remember this is my craft blog, and stop fawning over my kiddens. I’m going to rest up so I can get back to creating! I had no choice but to go to the doctors today to get a script. 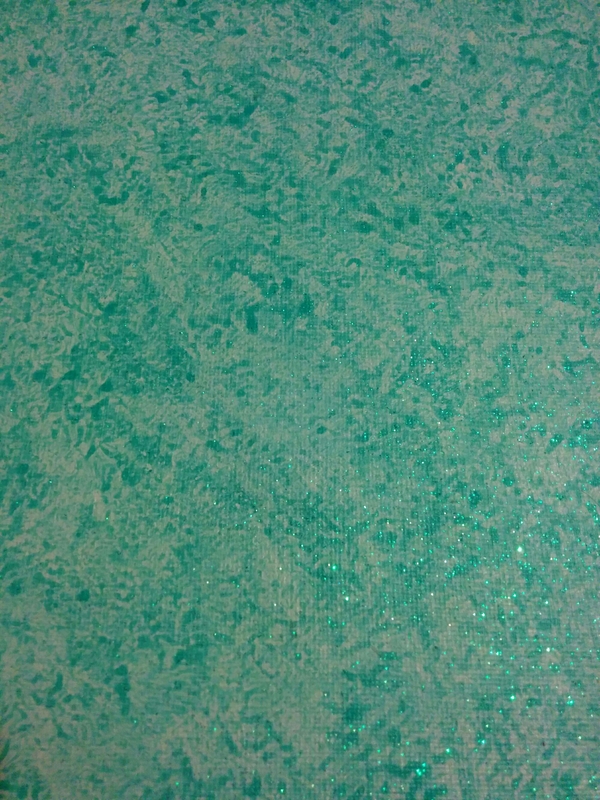 I wasn’t happy about leaving my cozy station that I had set up to do some Christmas themed embossing. To take the sting out of sitting in a waiting room for two hours with screaming children and snotty women, I decided to buy some craft supplies. I’m not sure how much of a reward this was, as I had to spend my own money. Luckily I didn’t go too crazy. I found some paper pirate chests that you fold and decorate yourself. 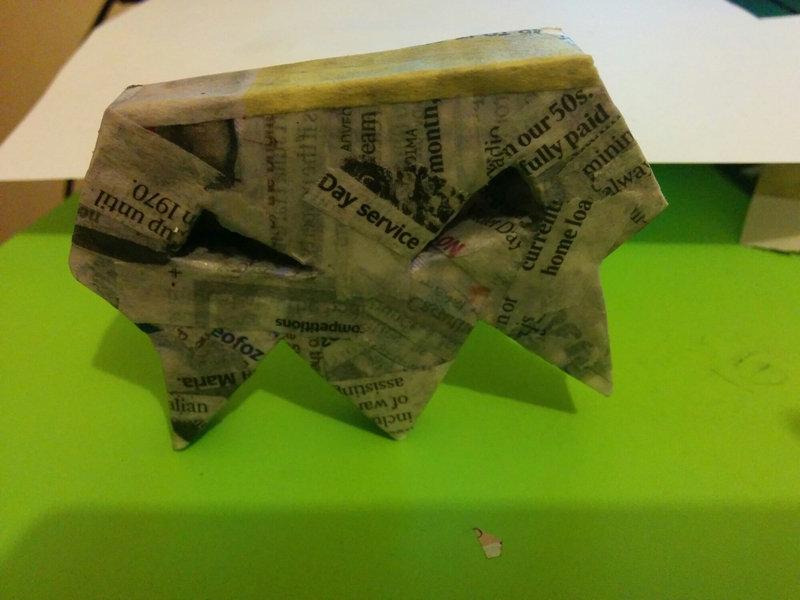 I thought it would be nice to cover it with paper mache for texture and sturdiness. 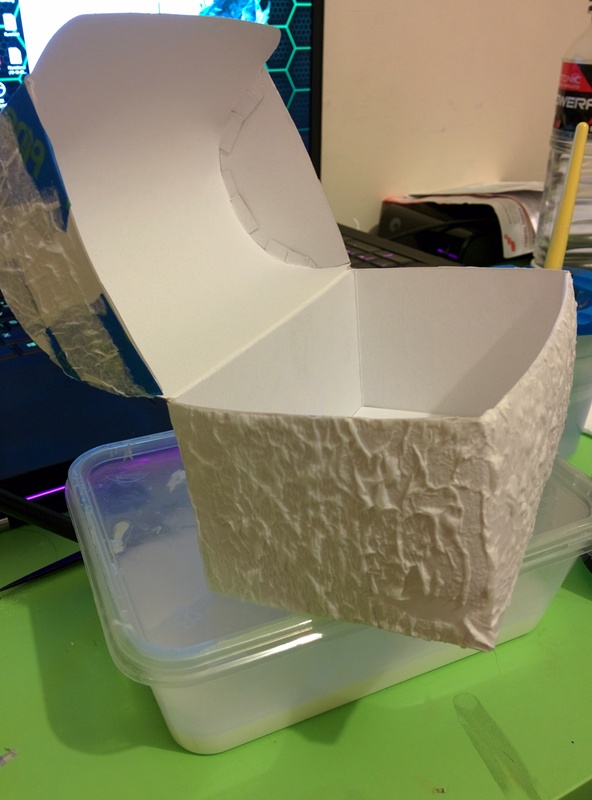 When I put it together, the lid was just a strange flap that you tuck in to close. I performed a little bit of paper surgery, and turned it into a proper lid. I can add a clasp or something later, if I decide to. There are six boxes in the pack, so I have some to play with. I also got a bag of craft foam off cuts. This will be great for cutting out letters and shapes on my Big Shot, as well as freehand. Most of the pieces are adhesive already, but I have plenty of double sided sticker sheets left. 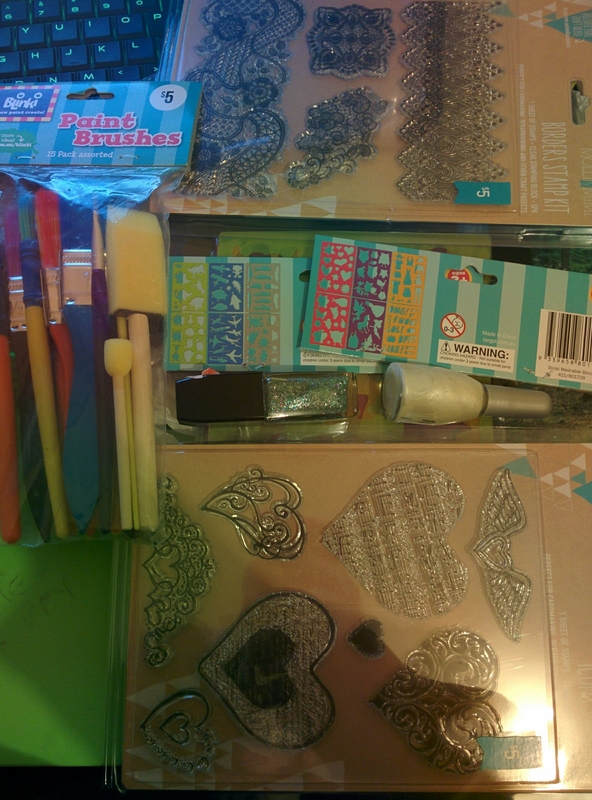 I picked up some supplies for card making, like rhinestones and number stickers as well. I should get to bed. It’s been a very long day, and there isn’t enough money or craft stores to keep me sane without some beauty sleep. Between cleaning, I’ve been working on my new colouring book. This piece is the third one that I’ve worked on, as the others weren’t working as I had hoped. 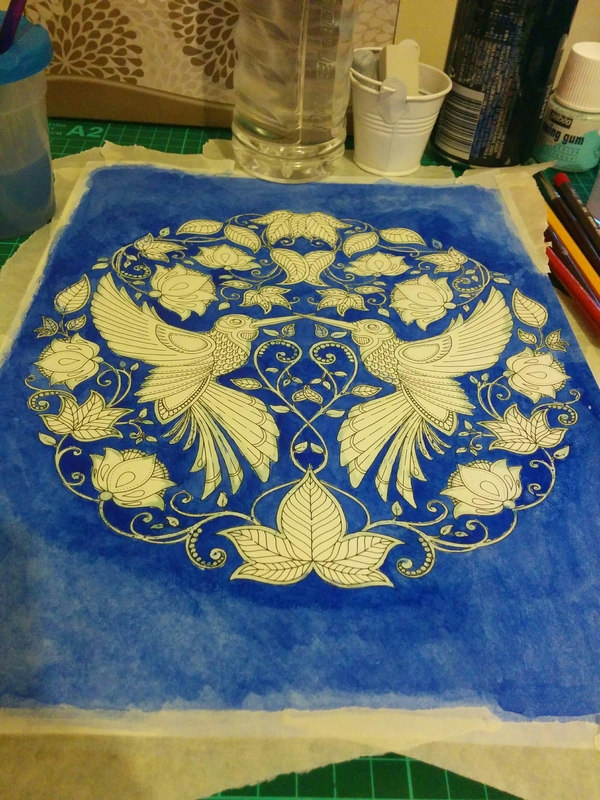 I used masking fluid to cover the lines and applied quite a few layers of straight blue watercolour. In the previous picture I painted, I chose a colour that I had to mix, and didn’t mask before painting it. This resulted in a horrible mottled look that looks rather muddy, as I had to mix purple myself, and that rarely goes well. Combined with the fact that I had to use a small brush so I didn’t paint over the already painted flowers, and I had to keep mixing more of the colour, it seemed doomed from the start. This time, I took a bit more time planning, putting light layers and building up colour, which makes it nicer, even and easier to fix mistakes. I was painting this with a lamp on, and with a small brush doing touch ups after removing the masking fluid, and I felt like an illustrator, which was cool. Other than that, I’ve been shuffling through a great big pile of catalogues that I’ve collected, looking for images for the bottle cap pendants. I have quite a few now, I’m even having to cut back on the images, in case I run out of domes. I guess I can keep them for later. I’m always looking for inspiration and images, and I can buy more domes or use resin another time. 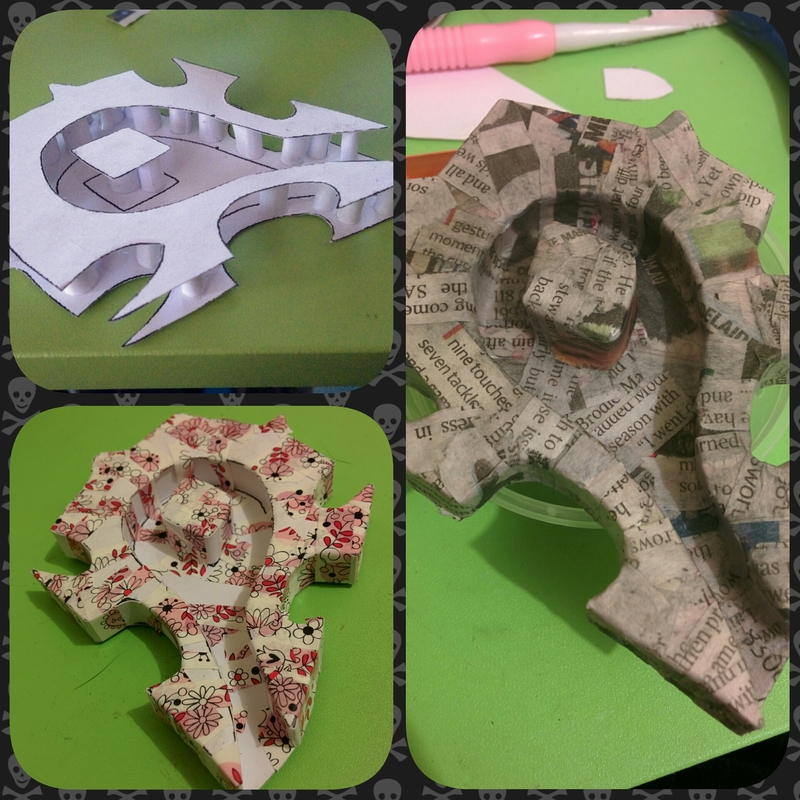 The left over paper is mostly being cut into pieces to be used for paper mache. I had an urge to make a really big paper mache sculpture, like a chair or something. Not sure how I’ll go with my motivation on big projects. I’m only at the start of the thinking process though, perhaps a fancy cat bed or footstool would be much better. I came up with an idea for a scratching post as well. So much to do! 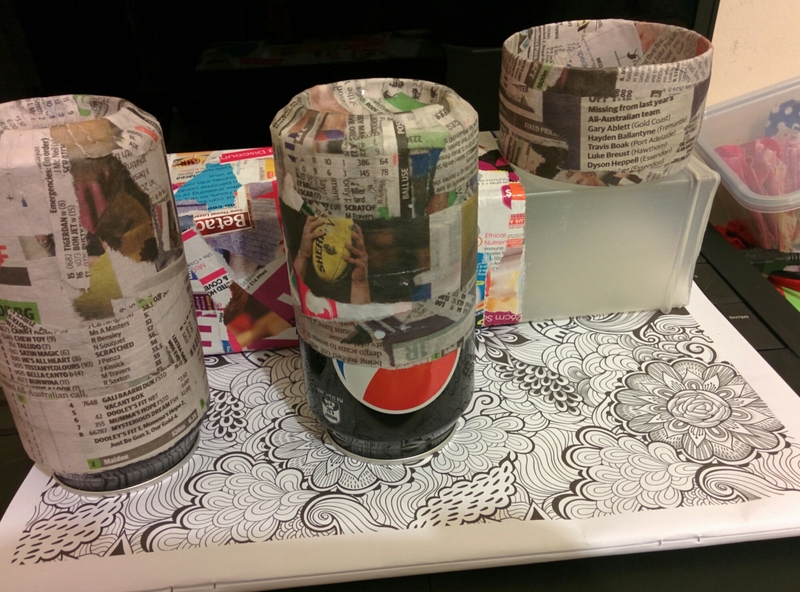 This isn’t what it looks like, it’s just gluing paper to each other using containers as moulds. 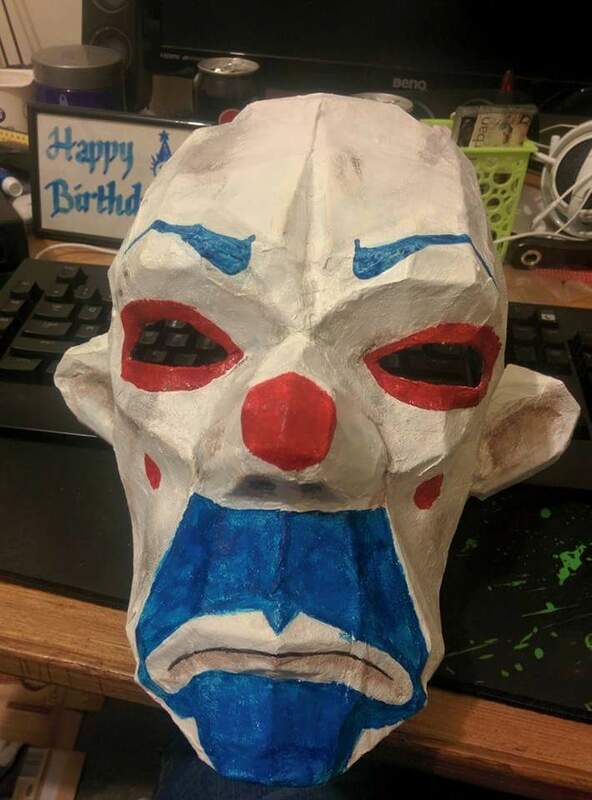 Ok, you got me it is paper mache, again. It’s an illness, that’s easy on the hands, mostly. Later on (after nap and din-din) I decided to do some colouring, which I decided to do in graphite (nothing to do with being too lazy to get my pencils, at all.) I wanted to do different media to colour in the book, so I’ve started one page in marker, and want to do other pages in Biro, coloured pens, paint etc. Also in different brands of coloured pencils. Graphite drawing is my most favourite and comfortable art out of all the types. I was rarely seen in late highschool without a book and pencil, and I drew every night. Before I knew it, I was rather good at drawing. I still have a long way to go, and can’t always draw everyday, but I do what I can, when I can. So today, that was colouring a portion of a page. This would be a great exercise if you want to practice shading. Imagine depth, height, light, shadows, reflected light and shape, as it can all be shown with shading. This is easier to learn in gray scale, than in colour, but then, I have trouble putting colour into pictures, and it all looks like monochrome sections. As I said, I have a long way to go.